I have nothing against Pearl Jam, but I'm more than a little sick of them covering Neil Young's "Rockin' in the Free World." Covers are usually special and unexpected. This is done at virtually (if not literally) every show Pearl Jam plays. Also, of Neil Young's entire catalog they choose "Rockin' in the Free World?" Can't they throw out "Cortez the Killer" or "Like a Hurricane" once in a while? It's getting to be their "Freebird" and it's not even their song. So why am I writing about it you ask? Maybe because when they performed it in Portland recently they had all three members of Sleater-Kinney on stage to perform it. 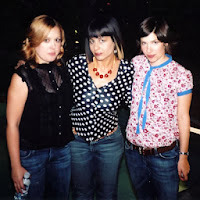 All three members of Sleater-Kinney. They haven't been on a stage together in seven years. I love Wild Flag and all, but Sleater-Kinney reunion please now thank you? Also, Peter Buck and Scott McCaughey from The Minus Five were there, too. Did you ever think you'd see the day Sleater-Kinney got more attention than R.E.M. ?